After acquiring animation equipment in 1960, Jim began experimenting with his Bolex 16mm camera. He tried a variety of techniques including stop motion and painting under the camera. He created abstract explorations with colored paper and drawings, timing their motion to match specially recorded jazz tracks. For his 1964 short film Time Piece, Jim cut paper into geometric shapes and filmed their action as they moved to the rhythm track, creating short sequences bridging the action of the film. Little pieces of animation appeared in Jim’s commercials, providing illustrated explosions in lieu of pyrotechnics or depicting a character’s thoughts. When transferring his creative vision the screen, Jim used everything in his arsenal – live action, puppets, and animation. Later he would add animatronics and digital graphics to his tool kit. After using animation for brief bits or as elements of longer pieces, Jim made an effort to create a longer cut-paper animated fable with a coherent story, a fully developed script, and a professional score: Alexander the Grape. 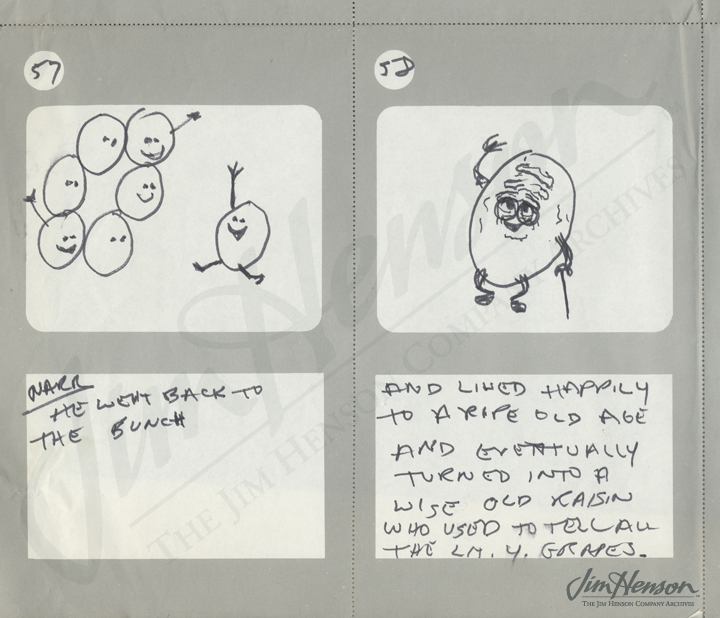 Jim wrote the script (the typed copy is dated 9/24/65 – his 29th birthday) and drew a storyboard. For many of his short films, Jim collaborated with jazz composers like Chico Hamilton and Raymond Scott on the scores, but for Alexander, he hired Billy Mure to write the bouncy music. On November 11th, he went into the studio and made a polished recording of the words and music. In the meantime, to create the visuals, Jim cut colored paper into the shape of grapes and other fruit which he moved before simple hand-drawn backgrounds on his animation table. He never completed the animation, but in 2009, the Jim Henson Company Archives rediscovered audio tracks and the animated footage that had been finished. Augmented by scans of Jim’s storyboard that fill in the missing visuals, the resulting film is a delightful peak into Jim’s creative process and his work from those early years. See the archival reconstruction of Jim’s short, Alexander the Grape. Learn more about Jim’s early animation efforts and see a sample. Storyboard panel for Alexander the Grape, 1965. 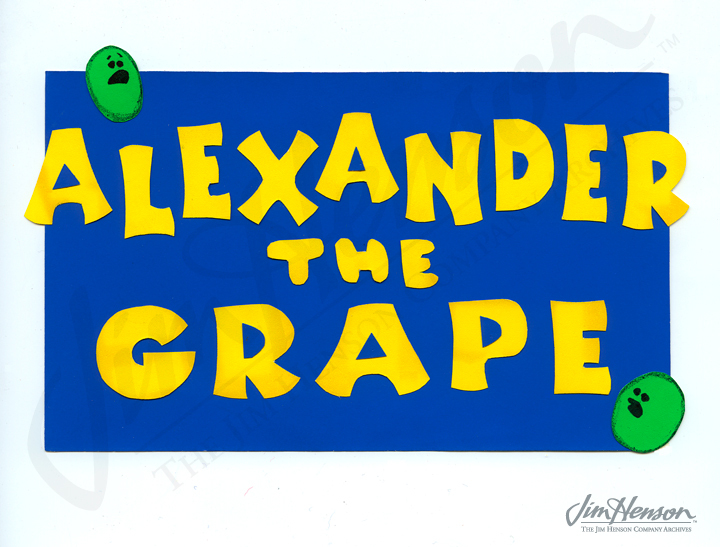 Animation elements for Alexander the Grape, 1965. This entry was posted in 11-November '65, 1965 and tagged Alexander the Grape, Billy Mure, Chico Hamilton, Raymond Scott, Time Piece. Bookmark the permalink.